You planned an awesome webinar on something you’re passionate about. So, how do you get the word out there and get people to show up to see all the great things you have to say? You could try to just wait it out and hope people will find it organically, but chances are, that probably won’t work all that well. 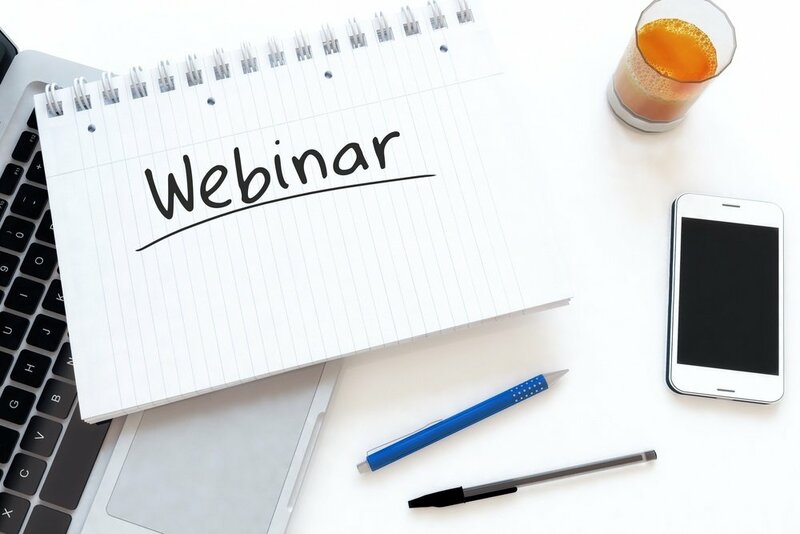 To supplement all your hard work in planning the webinar, here are 12 proven methods to promote it and drive more people to want to register. First, start with an optimized landing page. Once you have a perfect landing page, ensure the rest of the conversion path makes sense. What happens after they register? Send them to a thank you page that confirms they’ve successfully saved their spot, and if you’re up for it, ask them if they have any questions up front. By asking for their input, you’re letting them know you care about what they want to learn, and there’s also a better chance of them attending. Bonus: You can lengthen your webinar by adding registrant-confirmed valuable content without even having to think about what to talk about! In addition to bringing them to a thank you page, make sure you’re also sending them a confirmation email with the time, date, and link to join the webinar when it comes time. I recommend using a webinar hosting software such as GoToWebinar to help automate this process for you. If you’re using HubSpot, there’s a great HubSpot/GoToWebinar integration that works flawlessly. Now that the conversion path has been successfully built, you’re ready to start spreading the word! When you should start promoting is really up to you. Some people like to start at least 1 week before the webinar; I personally like to start 2 weeks ahead, giving me more time to test and pivot, if needed. Once you host a few webinars, you’ll gain better insight into how quickly it takes to reach your prospective registrants, and you can increase or decrease your promotion time to what makes sense. If you’re unfamiliar with a hello bar, the one thing you should know is that it’s proven to be very successful in increasing lead generation. A hello bar usually enters across the top of your screen (it can come from the bottom as well if you have awesome web developers on your team) and spans the full width of your browser. Depending on what you’re trying to promote, you can put a sentence or two of text with a link or call-to-action to the page you want the visitor to land on. It’s definitely worth testing to see how your visitors react. Similar to a hello bar, an exit-intent is a bit more intrusive -- but again, also proven to increase lead generation. I don’t suggest putting this on every page of your website, but instead, having this on your blog is a great place to test it. An exit-intent pops up (usually) when someone hovers their mouse outside of the website page, including a different browser tab or the X in their browser window. This action causes them to stop for a few seconds and quickly read about your offer. You’re giving them another chance to convert. Note: If you use this to promote your webinar, make sure it shows up on relevant pages or articles -- somewhere where it would make sense for a visitor to take this next step in their journey. Also, make sure to hide it from people who are already registered for your webinar to decrease message repetition and potential annoyance. Promotion doesn’t have to just be in writing! Record a 1-2 minute video telling all about your webinar and what you plan to cover. If you have multiple presenters, try to get everyone to contribute. When you’re done, upload your video to YouTube, and promote it via social media. There are a bunch of webinar listing sites that let you promote your webinar. Places such as tellonline.org and webinarbase.com only require a few steps to put your webinar on their websites for free. This one is super easy. Add the webinar landing page link right to your email signature! If you or your team emails a lot of people on a daily basis (especially prospects), this is a great way to spread the news of the webinar to people outside of your regular database. At IMPACT, we've been using Sigstr to do this! Typically when we think of thank you pages, we think of providing the contact with the offer they just filled out the form to get, but it doesn’t have to stop there. Give them some next steps or action items to keep them engaged and on your site longer. As I mentioned in #3, you want to make sure promoting the webinar in this way is relevant and a sensible next step for the contact who just converted. 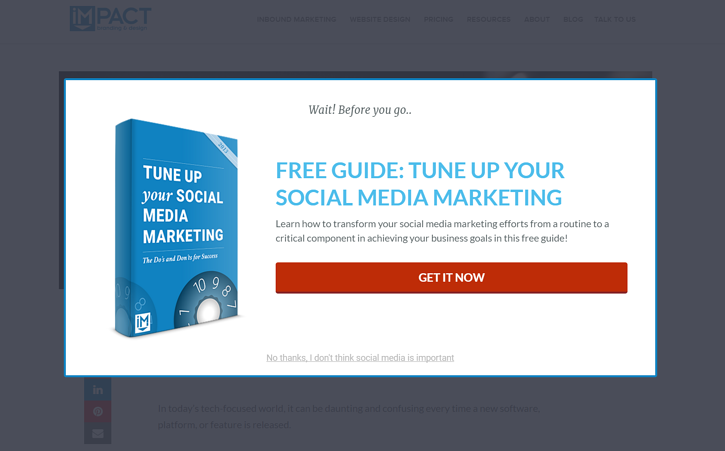 For example, if you’re hosting a webinar about how to effectively publish content on social media, and the contact just downloaded an ebook on email marketing, it may not make the most sense to promote your webinar on that offer’s thank you page. If you have blog articles that talk about a similar topic to your webinar, why not use them to help promote? Add some internal links leading to the webinar page, and think about adding a CTA to the bottom of your articles. You can also try working the CTA within the body of your posts to capture readers at the beginning, in case they don’t read to the end. In addition to creating some blog CTAs, why not write a promotional blog article dedicated specifically to promoting your webinar? Similar to the landing page, make sure you include all the essentials and reasons why people should attend. Then, publish your blog, promote it on social media, and have it go to all your blog subscribers to increase the number of people you can get it in front of! If you’re thinking about implementing a lead magnet into your website strategy, make sure the offer is short, specific, and valuable. Long, complex lead magnets will most likely not convert very well. Normally, a lead magnet is supposed to deliver the value within about 5 minutes of the contact filling out the form, so if possible, I recommend pairing the webinar with something they can get instantly, such as a one-page "tips & tricks" document or something else they can use right away while waiting for the webinar day. Getting an effective email workflow down takes some testing. After doing research and trying a combination of different email types and sending schedules, my team has created a suggested baseline strategy for promoting webinars. Feel free to alter it as you see fit for your email database. This email should have similar content to the landing page, letting your recipients know you’re having a webinar, telling them what it’s about, when it is, and giving them an easy way to register. This email may be broken up into two separate emails sent to 1) people who clicked on your last email but did not register, and 2) people who did not click on your last email at all. Both emails should remind the recipient of the webinar, but also ask for some feedback on why they haven’t registered yet. I like to create a separate landing page to link in the email asking for their reasoning. For example, maybe the day or time doesn’t work for them, or maybe they’re just not interested in that topic. Whatever the reason is, you can take this feedback and use it to plan your next webinar. This email may be a little much for some contact databases (after 2 emails, the contact has probably made up their mind), but it’s always worth testing if you think it has a chance. Registrants: Send your registrants (even if they didn’t attend) the recording of your webinar. They should not have to fill out a form to access this since they already did this when they registered. Include some social share links, and ask them to share it with their co-workers, friends, or family who would also be interested (but make sure the share links bring them to a landing page that gates the recording!). Non-Registrants: Send the people who didn’t register a chance to still view the recorded version. If they couldn’t make the webinar that day or never got around to registering, this gives them the option to watch it at their own leisure. Provide them with the link to the landing you’ll create for the recording so you can measure and record conversions. Social media may seem like the obvious option here, but it’s often underestimated. If you have large followings, you may see a lot of traction from publishing short, sweet posts with a link to your webinar’s landing page. If you’re using LinkedIn, try posting on your own page, your company’s page, and within relevant group pages. However, if you’re not quite there yet, paid social ads are a great way to increase awareness. LinkedIn, Facebook, and Twitter all offer paid options, so it’s best to do your research and know where your personas hang out most. If you’re hosting the webinar with another person or multiple people, have them leverage their followings or databases. Have them write a blog about it or send a message out on their social media platforms. The more people you can promote the webinar to, the more shares you will get -- which means more registrants for your webinar. Another tactic IMPACT has seen great success with in promoting its webinars is paid ads on social media. Both Facebook and LinkedIn now have comprehensive ad platforms with detailed targeting abilities to help you reach new people or even retarget past visitors who have shown interest in the subject matter. Create an optimized landing page with an easy way to register. Start promoting your webinar at least 1-2 weeks ahead of time. Make sure to ask for feedback on why some people may not be able to attend. Test and retest. Find what tactics work best for your webinars and your personas. Remember to record the webinar so you can send it to your registrants afterwards, as well as continue to promote it (as long as it’s still relevant).